This recipe is based on a combination of this recipe and this one. I reduced the sugar, used half the butter, half the egg, and it still tasted aaaamazing! I also reduced the steps to save on washing up haha. 1) Melt the butter in a large heatproof bowl (I just pop it into the microwave for 30 seconds). Add the milk and heat again. Add yeast, stir and set aside for 2 minutes. 2) Throw the rest of the ingredients (egg, sugar, salt and flour) into the yeast mixture. Stir well for a good 5 minutes. I don’t use a mixer, I just use a big spoon and my hands, for easy washing up. Cover with cling wrap, set in a warm spot for 1 hour for the dough to double in size. I put it on my bench top in the morning sun. 3) Make Filling: Mix butter, brown sugar and cinnamon in a bowl and set aside. OR you could skip this step and save on the washing up! 4) Make Glaze: Melt butter in microwave. Mix in icing sugar and milk. Set aside. 5) Lightly flour your surface. Give your dough a really good knead. Roll it into a log shape, about 40cm long. Use a rolling pin to flatten it out into a rectangle about 40 x 25cm. 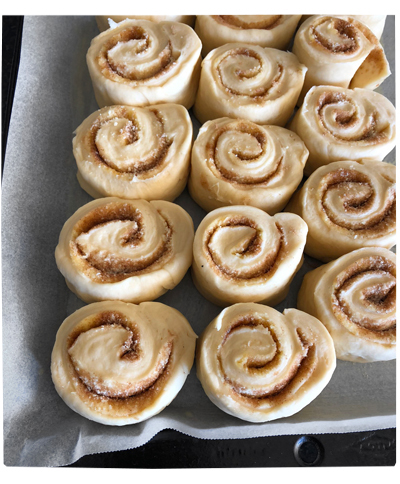 6) Spread the butter, sugar and cinnamon filling evenly over your dough. 7) Start with the longest side, roll up the edge, and tightly roll into a scroll / log. Cut into 12 even pieces (I did 16 pieces). Place them side by side on a greased pan. Set aside for 30 minutes. 8) Preheat oven to 180C. Bake for 20 minutes. Remove from oven, drizzle over the glaze. Eat while hot! It can keep for up to 3 days in an airtight container. I loooooove cauliflower, especially big chunks of roasted cauliflower. 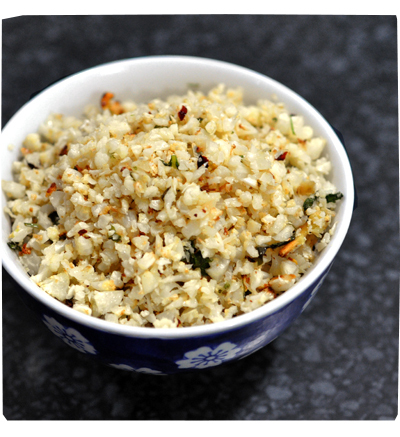 I don’t usually make cauliflower RICE, because I can’t be bothered to use and wash my food processor. But I made it recently and I really enjoyed the texture and flavour. And now I’ve been making it once a week for myself, and eat it instead of rice. Super easy to make! Not soggy or mushy! 1) Cut and wash a head of cauliflower. Process it in batches. 3) Toss, spread over a pan. Put into 180C over for 40 minutes, take it out midway to stir. 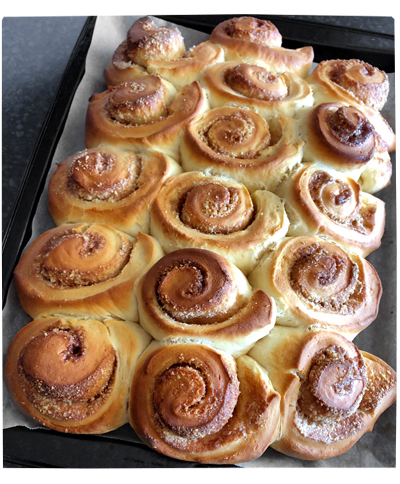 Notes – I sometimes bake it at 200C for 30 minutes. I like it with a bit of raw/not over-cooked crunch. The only problems is: if I eat it on it’s own, it doesn’t fill me up, so I end up having 3 (maybe 4) heaped bowls of it – oh well. 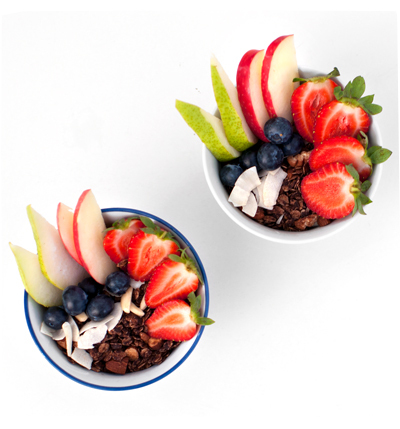 Hi everyone, after so many requests I’m sharing my chocolate granola recipe – again! The recipe is slightly different, I just use smaller portions, so it makes 4 cups of granola. 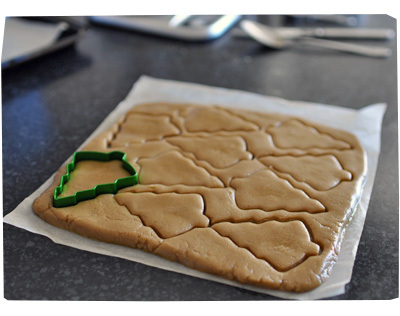 This way, it fits on two baking trays, takes 10 minutes to make, 10 minutes to bake and 1.5 hours to cool. And I can store it in an easy-to-manage 1L glass jar (stays crunchy for longer). 1. Pre-heat oven to 150C. Line 2 baking trays with baking paper. 2. Put coconut oil, cocoa powder, maple syrup and vanilla essence in a small saucepan and stir slowly over low heat until smooth. 3. Mix the oats, almonds and walnuts in large bowl. Pour in the chocolate mixture in and stir until all the dry ingredients are well coated. 4. Divide the mixture up onto the 2 baking trays. Bake for 10 minutes. Then turn off the oven and leave the granola in the hot oven for another 30 minutes. 6. Take the pans out of the oven, let it cool completely in the pan (about 1 hour). It will harden and crisp up as it cools. * Note you might want to check on your granola as it bakes, as some ovens run hotter or cooler, so you don’t want to burn all your expensive nuts/seeds! I’m not sure what to call these, as they are a slight variation of my Gluten-Free Chocolate Cake Recipe, which I have featured on my blog many times before! I made this recipe, because I needed something NOT TOO SWEET to throw into lunch boxes, and for quick on-the-run snacks. My boys also need extra protein for growth/muscles, and this brownie is pretty much made from almonds (protein), egg (protein), butter (protein) and chocolate (bit of protein)! Yup, they are perfect for my boy’s school lunch boxes. 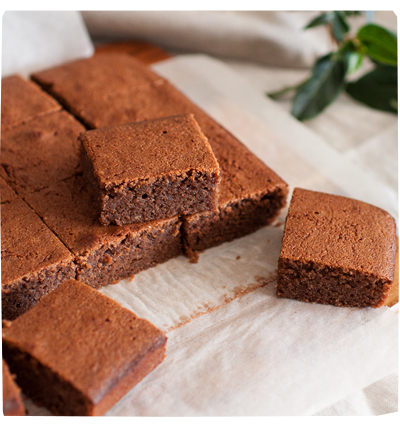 They are soft and moist like cake, but they hold together really well, like a fudge brownie. 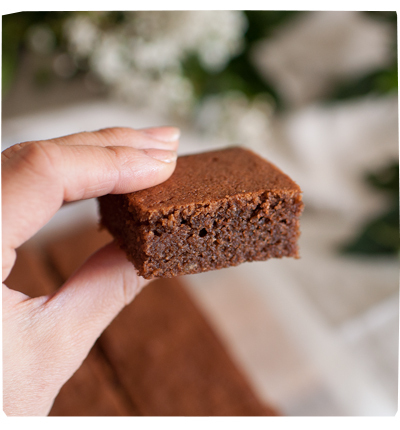 Their taste and texture are similar to that of a light, chocolate cake. 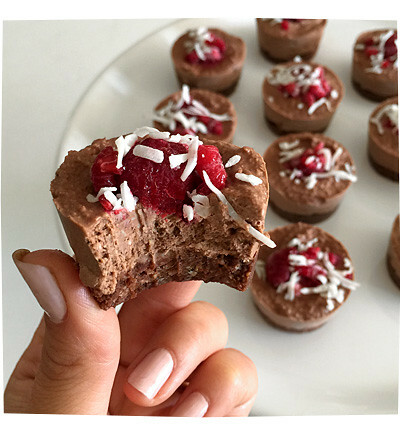 They are SO yummy and easy to eat, as they are not super-sickly sweet. They don’t taste weird, bitter, overly nutty and “healthy”. So easy to make, only uses 4 ingredients! I use 140g of cooking chocolate — half milk chocolate (70g) and half dark chocolate (70g) in order to reduce the sugar. Too much milk chocolate is too sweet, and too little milk chocolate makes it a bit bitter. Maybe you’d like to play around with the ratio to suit your own tastes, but I found my perfect ratio is 70g milk : 70g dark. I tested this recipe about 12 times now haha! 1. Preheat oven to 160C. 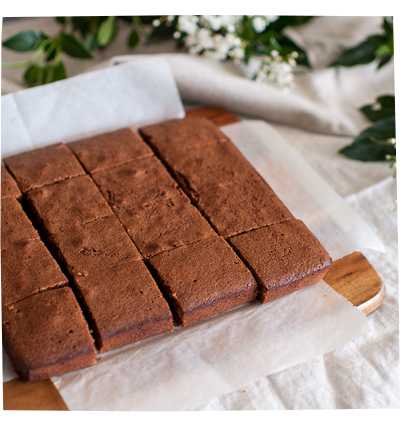 Line a 20cm square cake tin with baking paper. 2. Slowly melt chocolate, butter on VERY LOW heat, and keep stirring until JUST smooth. Then let it cool for 10 minutes. 3. Whisk the eggs lightly in a separate bowl. Sift in the almond meal, or just stir out all lumps. 4. Stir egg + almond meal mixture into the chocolate mixture, until well combined. 5. Pour into the cake tin. Give the tin a thump to get rid of air bubbles. 6. Bake for 30 minutes or until your skewer comes out clean. Cool in the tin for another 10 minutes. Slice it up and eat! So moist and yummy to eat! They are easy to freeze and store too! As some of you might know, I used to make a lot of protein balls – which is basically a mixture of almonds, oil, dates/sugar – but omg I hate rolling those balls, because they are messy and I’m lazy. For me, these are much easier for me to make! 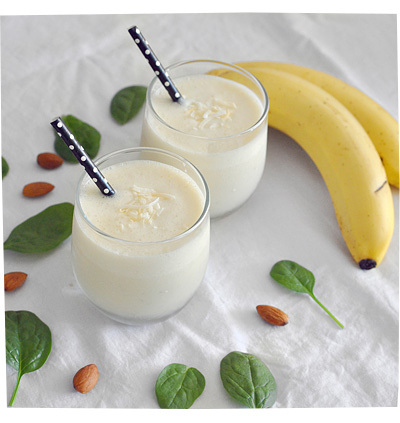 I don’t really like banana smoothies, but I often make them because my kids love them. It’s also good way to use up bananas, either fresh or frozen. Plus it’s a great way for the kids to get some extra calcium and protein in their diets. Truth is, I’m writing the recipe here because my kids can now make smoothies for themselves. So this way I can just tell them to look up the recipe on my blog and I don’t have to shout out the recipe from another room, haha! I’ve found that the simplest recipe is always the best. 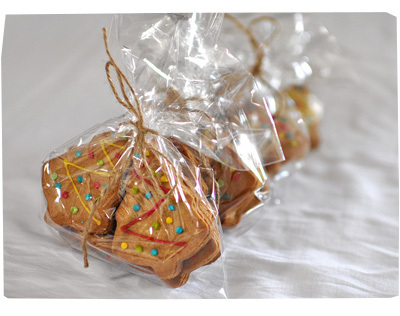 I made a huge batch of delicious Spiced Vanilla Christmas Cookies for my neighbours and friends! 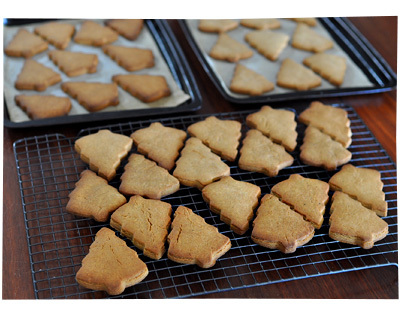 I made about 80 biscuits in total, then I was sooo over it and refused to make any more. However they were SO YUMMY that my kids (and myself) ended up eating about 20 (over a week) and so we only ended up giving away 12 packets (4-5 biscuits in each) away. Next time I think I’ll make stars, or round shapes, because my Christmas tree and Christmas men shapes were much too big and a gift bag of 4 biscuits looked really inadequate. I think 8 stars would look much nicer. 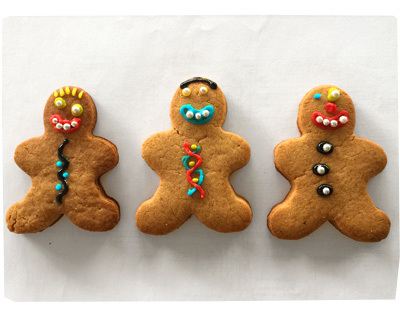 The recipe that I used is a variation on Jamie Oliver’s Ginger Bread People recipe, because I don’t really like ginger flavoured biscuits, plus I discovered that my ground ginger was out of date by 6 years haha! The cinnamon and nutmeg add a gorgeous, subtle flavour to the sweetness of the biscuits, so it doesn’t taste like a boring butter cookie. I only used 1/4 teaspoon of the spices (instead of 1/2 teaspoons), because I don’t like super-spicy biscuits. 2. Melt the butter, sugar and golden syrup in a small pot on low heat, until the sugar is dissolved. Stir until well combined. 3. Mix flour, bicarb, vanilla, cinnamon and nutmeg into a large bowl and stir. 4. Pour the butter and sugar mixture into the dry ingredients. Stir well until it becomes a dough. 5. Cut the dough in half. Place each dough ball onto each baking paper paper. Flatten them out to 5mm and cut out with shapes directly on the paper. 6. Bake for 12-14 minutes or until golden brown. Transfer to a wire rack to cool. 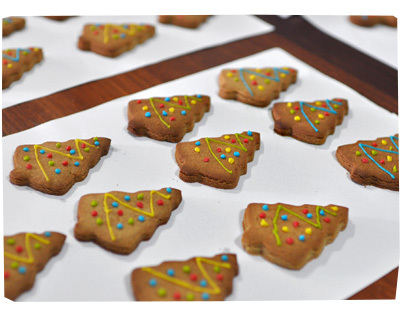 Decorate with icing and store in an air tight container. Mine were still delicious and crunchy after 7 days! As for the decorating… I was VERY STRICT with my icing instructions, that my kids helped me for 10 minutes then left me alone haha! I did let them make silly biscuit men! 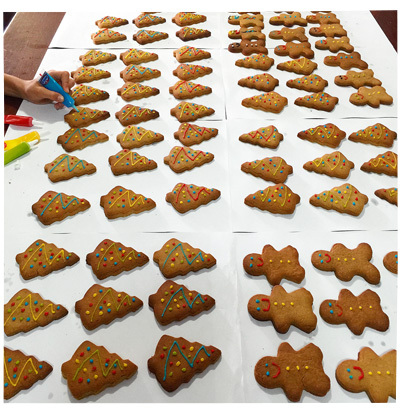 And I promised that I’ll make another batch for them to decorate how ever they want – after Christmas. Having a container of these in my freezer, has SIGNIFICANTLY reduced the amount of regular chocolate and ice cream I eat each week! 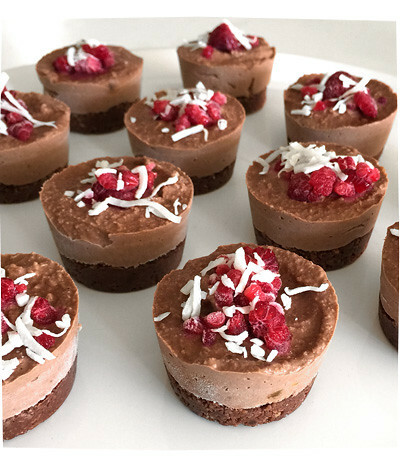 I prefer to make mini cheesecakes, instead of one large one. This is because the cakes have to be frozen and when you want to eat them, you have to take them out and defrost them for 30 minutes. Much easier to defrost a couple of small cakes, than 1 large cake. Plus they look hella cute. 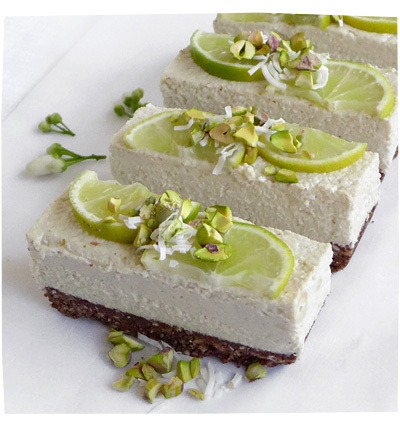 This recipe is based on my Raw Coconut and Lime Cheesecake, but I dump the lime and add chocolate and more dates. 1. Line a loaf tin (or a spring cake tin) with grease proof paper, or grease with coconut oil. 2. Base: Using a food processor, blend the almonds, dates, coconut, coconut oil, cacao powder and salt until it turns into an even grain. 3. Evenly spread and firmly press the mixture into the base of the tin. Pop into the freezer. You can do this the day before. I would cover the cake tin with cling wrap first. 4. Filling: You can either rinse out the food processor, or use a high-powered blender for this. Combine all ingredients and blend until smooth and creamy. You might want to adjust the taste by adding more lime juice or maple syrup. It’s supposed to have a limey punch! 5. Pour the filling over the base, smooth the top and pop into the freezer for at least 4 hours. I like to cover the tin with cling wrap to prevent it from drying out or absorbing any smells from my freezer. 6. Take out the cake to defrost for 30 minutes before slicing and serving. 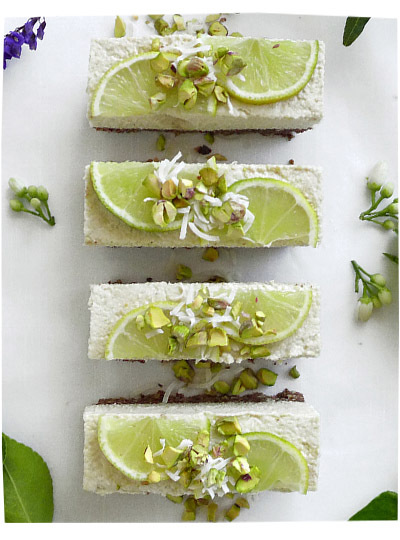 Decorate with sliced limes, crushed nuts and shredded coconut. 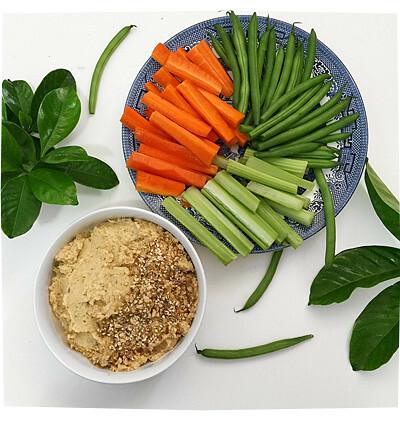 I love eating fresh hummus (or houmous) and so do my kids! It’s a great way to gobble up a whole lot of raw vegetables. It’s easy to make, there’s no cooking involved, I just have to whiz everything up in a food processor. You don’t have to make it with tahini. Most times I use 2 tablespoons of natural yoghurt. I always like to throw in different ingredients, like a few pieces of sundried tomatoes, or grilled eggplant, or sautéed onions, or chives, coriander or parsley leaves. Put everything in a good food processor and whiz it all up till well combined! If the mixture is too chunky, add a bit more yoghurt or lemon juice or water – whatever your tastes prefer. 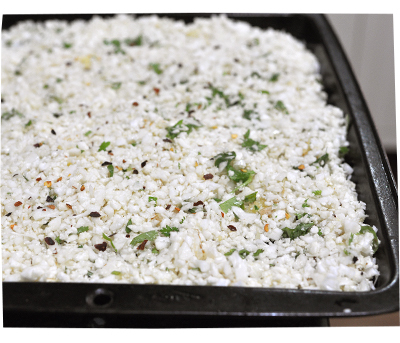 Optional – Sprinkle paprika or dukkah over the top (my favourite dukkah recipe here). 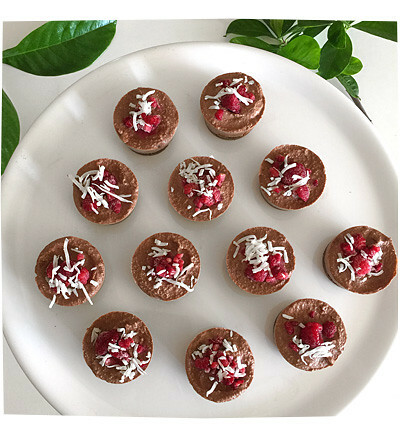 This dessert is a raw, dairy-free, gluten-free, no-bake recipe! Ok before you judge me as some crazy health freak… let me just say this: I eat WAY TOO MUCH ICE CREAM. At the end of the day, when the kids are in bed, the kitchen is cleared, the house is tidied… of course I like to put my feet up and relax. I don’t drink wine. I eat ice cream. OR chocolate ice cream AND chocolate biscuits, depending on my day! Well, this cheesecake is a nice healthy, low sugar alternative. It is really delicious. You would never think that blended cashew nuts would have the same consistency as cream cheese! It does! And it’s lovely. I love the sweet and slighty salty flavours (from the pistachios) and I put a bit of cacao powder into the base, to give it a hint of chocolate. 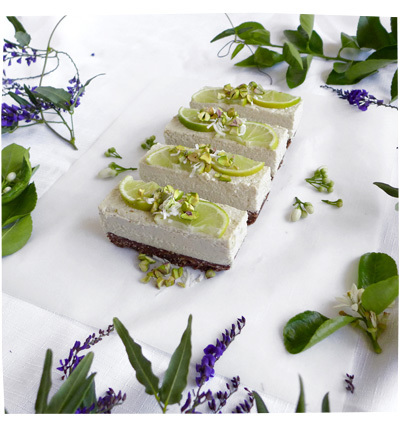 I only have one slice each evening with a cup of herbal tea, which is so much better for me than a bowl of ice cream! Not to mention I’m slightly intolerant to cow’s milk, so I always end up with a slight tummy ache and a bloated gut before bed. But do I learn the next night? No! Haha! I put together the recipe from 4 different recipes I found on the internet, and from my own trial and error. I’ve made it 3 times already, tweaking it here and there. Hope you like it! 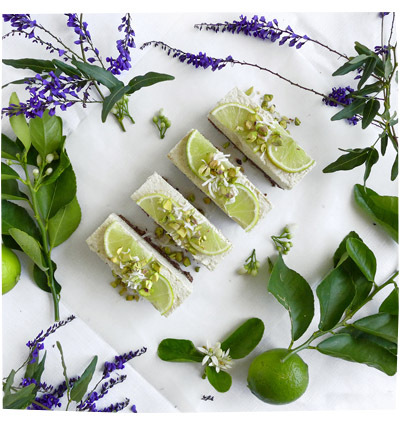 The only annoying thing about this recipe is that you have to soak the cashews overnight, then you have to freeze/chill the cake for at least 4 hours. Then you have to defrost it for 30 minutes before serving… which means you pretty much can’t eat it until the next day. 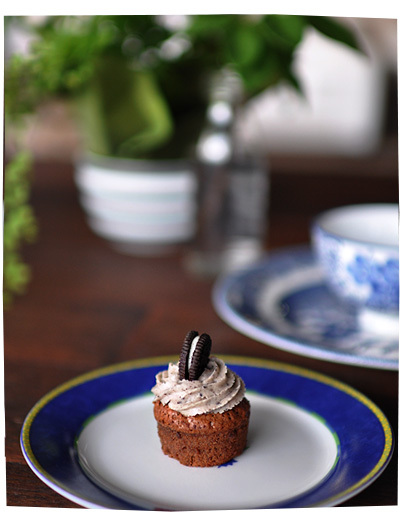 I recently made some gluten-free (flourless) mini chocolate cupcakes and topped them with crushed Oreo icing and a mini Oreo biscuit. I used my gluten-free chocolate cake recipe because it’s one of the best and yummiest cake recipes I know. The cupcake was – not surprisingly – moist and delicious. 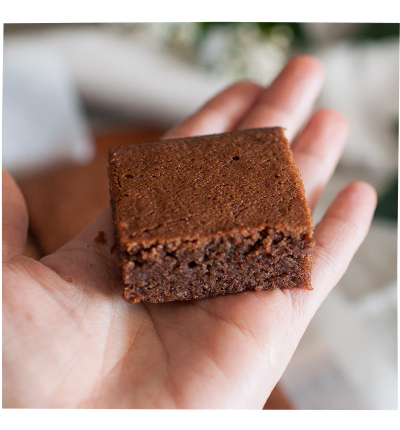 It was a bit like a light, soft, cakey brownie. I reduced the amount of sugar in them since I was going to put an icing topping on them, so they tasted lovely. I made 16 mini cupcakes for my girlfriend’s birthday party and they were a HIT! They looked great and had such a big visual wow factor. This is what they looked like in the centre! 1. Preheat oven to 160C. Spray vegetable oil over a silicone mini cupcake tray, or prepare 16-18 mini cupcake cases. 2. Slowly melt chocolate, butter and brown sugar, until smooth. Then let it cool for 5 minutes. 3. Whisk the egg whites until you can make firm peaks when you lift the whisk up. I use an electric hand mixer. 4. Add the egg yolks into the chocolate mixture, then stir in the almond meal. Mix until well combined. 5. Fold in the egg whites into the chocolate mixture, until well combined. Scoop a tablespoon of the mixture and fill each of the cupcake cases until they are 3/4 full. The cake will rise only slightly. 6. Bake for 20-25 minutes or until your skewer comes out clean. Take out of the oven and cool for 10 minutes. Lift out the cupcakes and put them on a rack to cool completely. 7. Make butter icing by mixing butter and icing sugar with an electric mixer for 5 minutes until thick and fluffy. Use a large tablespoon to scoop in the crushed Oreos a bit at a time. 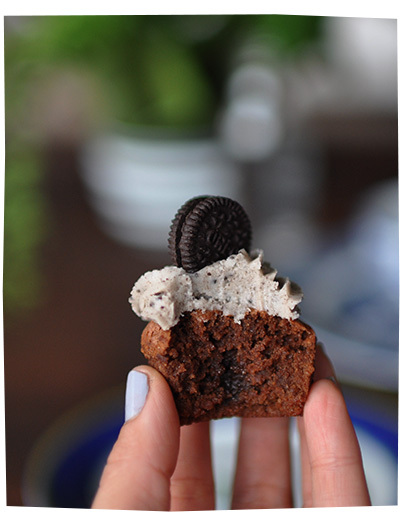 Mix well until you like the colour/Oreo concentration of the icing. 8. 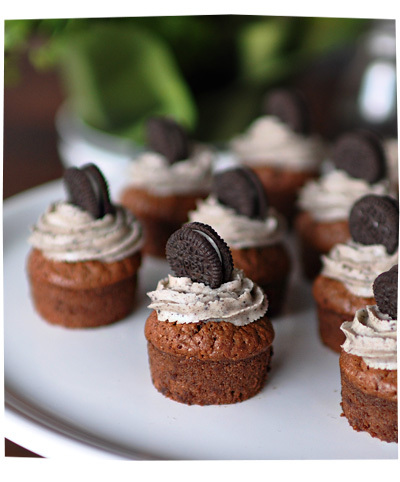 Pipe the icing onto the cupcakes and decorate with a mini Oreo on top!